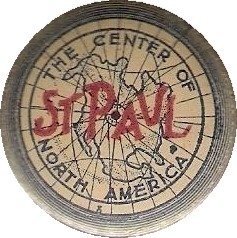 St. Paul, Minnesota, was the first American city to actively promote being located at the geographical center of North America. 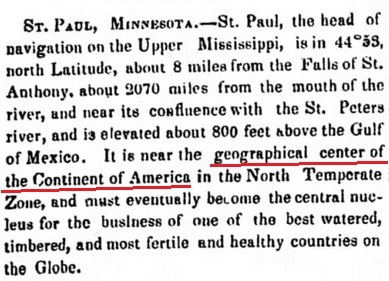 Newspapers began describing St. Paul as the geographical center of the continent as early as 1850. On September 18, 1860, presidential candidate William H. Seward was campaigning in St. Paul and began his speech by stating that he was at the center of the continent of North America, equidistant from the waters of Hudson Bay and the Gulf of Mexico and midway between the Atlantic and Pacific oceans. Little thought or promotion was given to this statement since few people possessed accurate maps to disprove it. 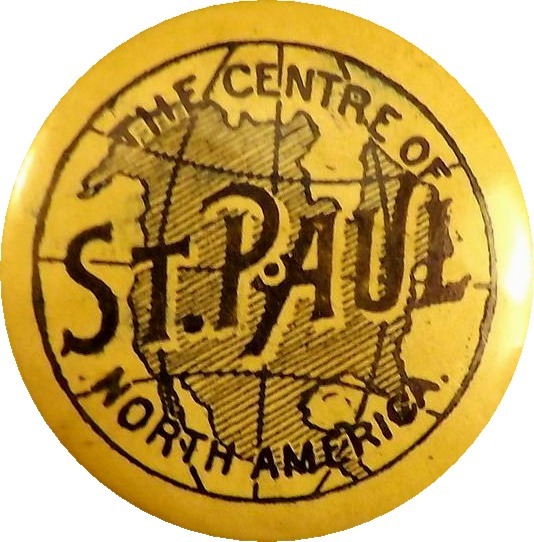 In 1893, the Commercial Club of St. Paul felt they needed a slogan for their city to promote commerce. 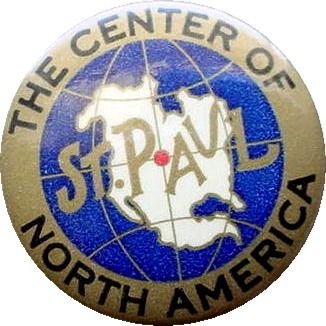 The winning entry was "St. Paul - The Center of North America". During the next 15 years, the city promoted itself as the center of North America and at least four pinback promotional buttons were made during this time. By 1910, the fanfare had died and few references were still being made after that date. Around this same time, Pierre, South Dakota, began promoting themselves as being at the center of the continent and geographically it appeared to be a better candidate for the title than St. Paul. The latitude/longitude position listed above is to the dome of the state capitol building in St. Paul. 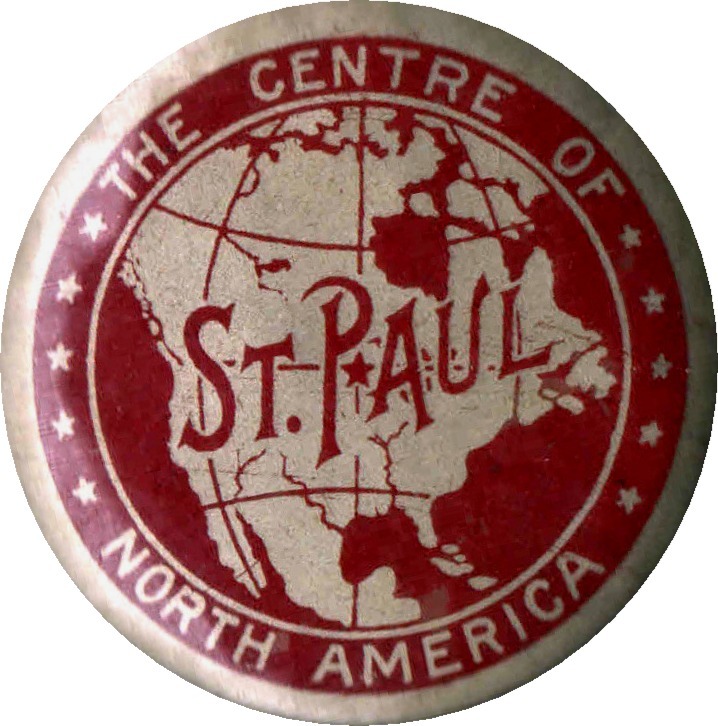 Pinback buttons promoting St. Paul as the Geographical Center of North America. 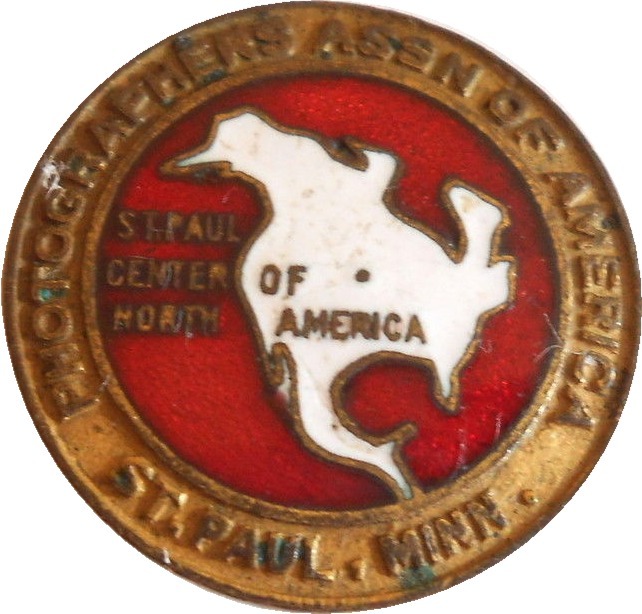 Enamel pin for the Photographers Association of America. 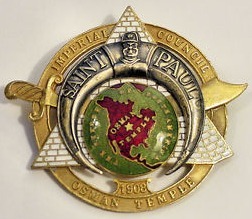 1908 Badge for the Osman Temple of the Masonic Imperial Council in St. Paul. "The Center of North America" in the green background. Detroit Free Press. May 24, 1850. Advertisement in St. Paul from 1894.